Of course, this is only a definition of the term. But what is the real significance of German adverbs? Well, like adjectives, adverbs describe the world around us – they make actions more spicy, they add texture to the stories that occur from day to day. Actually, you can’t say that your German is really good without mastering German adverbs. 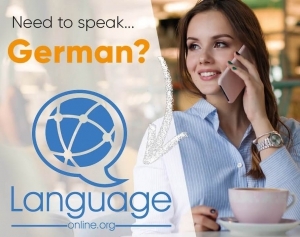 So, after you have passed for the basic parts of the German language, let’s start to customize your spoken language by learning some more about German adverbs! aaaaaaaaand, there are also adverbs of frequency, interrogative adverbs and causal adverbs. So, as we cleared up some basics and the structure of adverbs, let’s go for some more detailed explanation and some example for these three types of German adverbs. At the beginning we will talk about German adverbs of time. As you already know, these adverbs describe when and how frequently an action takes place. So, the only think of real importance here is the word order. Here, the adverbs have their position at the beginning of a sentence. Logically, we need some examples to illustrate that. So, here is a list of German adverbs of time for you. After learning some vocabulary, let’s use it in some example-sentences. – Sometimes I eat two Schnitzels, but I never eat three. – In the morning I go to school, but in the evening I am at home. – Today is a bad day, but tomorrow it can only be better. Well, I think you it is quite clear how to use German adverbs of time. Nevertheless, there can be a change in the word order, as I already describe above. So, here is an example for that. “Oft muss ich weinen.” – Often I have to cry. “Ich muss oft weinen.” – I have to cry often. Whether you use “oft” at the beginning of the sentence or at the third position, depends on how much you want to emphasize the time or frequency of the action. So, when “oft” is put at the beginning, you emphasize is, when in third position, you don’t. In the following, we will have a look at list of different adverbs of frequency. Causal adverbs indicate the reason or origin of an action. Causal adverbs serve as a connection between two sentences, given that they’re “Konjunktionaladverbien”. It must be emphasized that adverbs occupy a position and by placing them at the beginning of a sentence, they move the subject to the 3rd position. Now, let’s talk about German adverbs of manner. As you already know, these adverbs describe the emotion or the condition of an action. Logically, we need some examples to illustrate that. 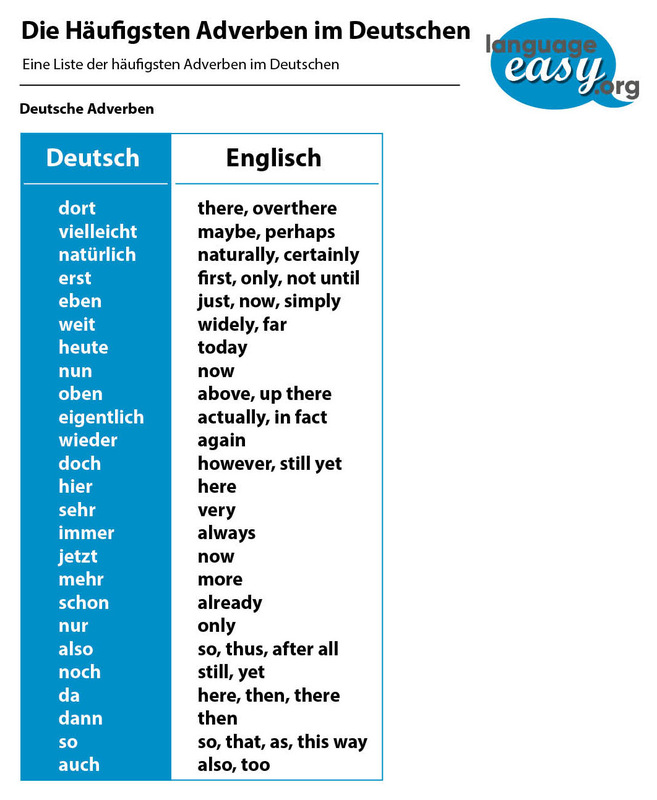 So, here is a list of German adverbs of manner for you. And here are some sentence where we apply our new vocabulary. – Hopefully you don’t think that I might be stupid. In this case, the phrase “Of course” might better express the intent. Just as “of course” symbolizes an action would usually not occur any other way. For example: “Of course you have to wash your have after leaving the bathroom.”- “natürlich” exhibits the same properties. Now, we will talk about German adverbs of place. As you already know, these adverbs describe where an action takes place. So, it is quite important for you to learn these German adverbs, as describing the place of an action is as important as its time or condition. Logically, we need some examples to illustrate that. So, here is a list of adverbs of place for you. “Da” and “Dort” are two important German adverbs when you want to describe the location of an action. Always depending on the context, especially “da” can have a lot of different meanings. For example, if you point on something specific, it can mean “there”. But if you are in a certain spot and you use “da”, it can mean “here”. Well, here are some other sentences that shall serve you as examples to illustrate the use of German adverbs. – You turn first right, then left. – Go outside if you want to play. – Wait there until it is your turn. – My girldfriend is looking for me downstairs.